Ousted Catalan leader Carles Puigdemont appeared in a German court Monday after he was arrested in compliance with an international arrest warrant issued by Spain over his region’s campaign for independence. 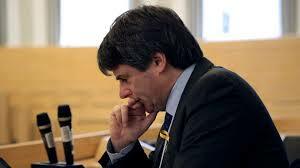 German lawyers said that the court’s decision on whether to extradite Puigdemont to Spain could take days. Puigdemont spent the night in jail after he was arrested by German police Sunday while crossing the border from Denmark. Puigdemont’s lawyer, Jaume Alonso-Cuevillas, confirmed the arrest on Twitter, adding Puigdemont was traveling to Belgium, where he initially fled after an arrest warrant was issued against him for his role in an independence referendum in October. Sunday was also marked by violent protests in the semi-autonomous region of Catalonia, where nearly 100 people were treated for minor injuries following clashes between pro-separatists protesters and riot police. The arrest follows a Spanish Supreme Court decision Friday to charge 13 Catalan separatist leaders with rebellion and other crimes for their attempt to declare independence from Spain last year. The ousted Catalan leader could face up to 25 years in Spanish prison. Madrid invoked special powers to take over the regional government after the Catalan administration declared independence in October.